Weather forecast through Tuesday of next week is temperatures in the low (we hope) 90s. Chance of isolated thundershowers Friday, Saturday and Sunday. Right now, these chances appear to be more north of us. Sunday, Carolyn was out with Lynn and David again. This is the third time they have fished with us and Lynn gets better every trip and catches more fish than the last time. David likes to pull streamers, but we really couldn’t find a pattern they wanted Sunday. However, we did boat a good number of fish on the red, size 16 D-ribbed midge. Dana had a couple guys, Darrell and his son, Jason, from Wyoming on the water for half a day. They said all the water is “blown out” on Wyoming. Their best patterns were the pink San Juan worm and a peach egg. Darrell and Jim both on the water Monday. Darrell had Jim and his wife, Jean, from Ohio out for 1/2 a day. They used to bring their children here many years ago to boat and enjoy the area. Now that everyone is grown and gone, they decided to start visiting the area again. They caught and missed several fish on a black zebra midge. Jim’s couple, Dan and Vivian, are from Kansas. 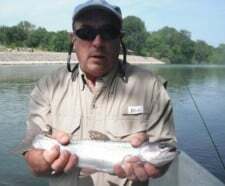 They are pretty new at this sport so Jim gave them a good fishing and instruction trip. Best patterns were a red midge, red San Juan and a #6 sculpin bugger. Jim on the water again with Dan and Vivian on Tuesday. Pretty much the same patterns and, of course, a little more instruction. They had a fun time. Stan took Rob and Matt, from Nebraska out for half a day. These guys fly fish….mostly for pan fish, but are now trout fishers! Said they had a good day and learned a lot. Best patterns were the red midge and the silver bullet crackleback. 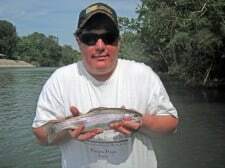 This entry was posted on Wednesday, June 8th, 2011 at 10:39 am	and is filed under Fishing Reports. You can follow any responses to this entry through the RSS 2.0 feed. You can leave a response, or trackback from your own site.